Recap – October 2018 : Squad – Communicate. Coordinate. Conquer. Now that the Halloween sugar rushes are wearing off, it’s time to unwrap the Recap! With the periodic technical tests going on, many of you have had a chance to see some of what Alpha 12 is bringing to Squad (Spoiler: It’s a lot. ), but how do you get the whole overview? Well, we’ve compiled the list of changes and, without further ado, the full changelog! Rally Points (RPs) are now set to Wave Spawns. When a Rally Point is deployed, a timer will begin to count down from 60 seconds continuously. Dead squadmates can select the Rally Point, hit the spawn confirmation, and will spawn when the Wave timer hits 0. Minimum time to wait is 20 seconds. For example, if the Rally Point timer is at 15 seconds when you died, you will have to wait until the timer resets and reaches 0 again. Rally Points now have unlimited spawns. Persistent Ammunition has been implemented for infantry. Spawning at the Main Base will always spawn you with a full ammo loadout. Soldiers spawning on a FOB or Rally Point will spawn with the same amount of ammo they had when they last died. Even if a Soldier expends all ammunition, they will ALWAYS spawn with a minimum of 2 bandages and 3 rifle magazines. If a Soldier swaps kit while in Deploy screen he will spawn with the above minimum loadout. This ultimately means that players respawning at a Rally Point or FOB will need to seek resupply before going back into the fight. All Riflemen now have ammo bags. Place them on the ground and any friendly player can rearm from them. A limit of 100 ammo points per bag exists and players can only have 1 ammo bag in the world at any time. Rifleman can have only 1 ammo bag in their inventory and pick up the ammo bag again at any time. Sandbags are the only item that cannot be rearmed from ammo bags. Field Dressings (Bandages) are now the tool to revive incapacitated teammates. Any soldier can use a field dressing to revive a downed teammate. Equip the field dressing and left-click and HOLD on the incapacitated teammate to revive them. The Medic takes much less time to revive, while all other roles take much longer. Field Dressings are still used to stop bleeding. Revived players have very low health and cannot regenerate stamina until they have some healing from a medic, which will dramatically affect their ability to perform in combat. FOB spawns are now disabled when 2 or more enemies are within 30 meters radius of the HAB. If the enemies leave the 30m radius, is killed, or incapacitated, the spawn point is re-enabled. FOBs now have a max capacity of 20,000pts for Construction and Ammo each. Random AAS map layers introduce a mode where the flag layout will differ each time with a variety of flag objective combinations. Normal AAS layers will still have the normal static flag layouts. Suppression will affect the way you take incoming fire now. When being shot at, incoming rounds will interrupt your aiming by increasing the amount of sway you experience. The more rounds fired at you, the more suppression you will experience. Larger caliber rounds will generate more of a suppression effect on you. You will not experience suppression if the fire is coming in from less than 10m away. Friendly forces will not be able to suppress you. Added physmat dependent rolling resistance for vehicles. Wheeled vehicles will roll much better on asphalt than on mud or snow. Wheeled vehicles are more affected by this than tracked vehicles. The lowest resistance is on asphalt, concrete, and solid wood. Gravel comes next, then dirt and grass. Sand and snow are where you’re really starting to suffer. Lastly, mud has the highest resistance and is terrible to drive on. For non-off-road vehicles, this change will have a significant impact on their ability to zip across maps at insane speeds and help to promote the use of roads. All Vehicle drivers can now use “SHIFT” (Default) key to maintain the current gear. E.g., Holding “SHIFT” while in 1st gear to drive slowly with the infantry, or to have high torque for hill climbing. Added World Origin Rebasing. As a player moves further from the map’s “origin point,” there is a subtle but exponential increase in tiny deviations or “scope jitter,” especially when looking through powerful optics. This gets much more dramatic as map sizes scale up and makes for frustrating gameplay when trying to fire weapons more precisely. World Origin Rebasing essentially repositions the origin of the world for each player dynamically to reduce the distance between the origin and the player, fixing the jitter that you experience in things like magnified optics, player animations, and nametags. Implemented parts of the new system CoreState that will allow for less load on server and client CPU. Bullet penetration system has been updated to be more reliable and allow for things like exit penetration effects and penetration through multiple objects and surfaces. Improved accuracy on detecting when to update the soldier movement component. New Weapon: RPG-29. A Heavy Anti-Tank role for the Insurgents. 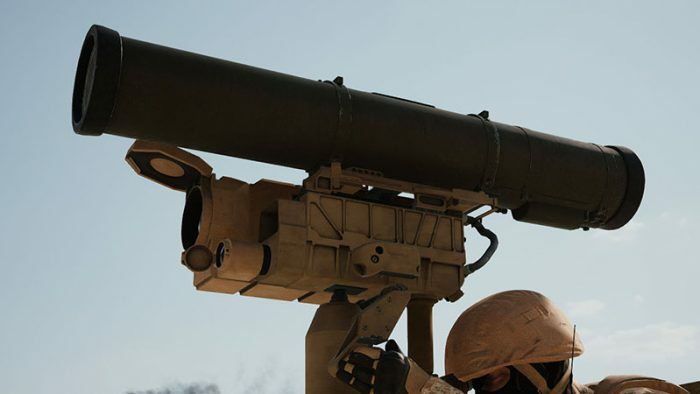 This weapon complements the lighter RPG-7 system, firing a huge 105mm tandem warhead projectile with more accuracy and further ranges (500m) than the RPG-7 counterpart (150m). New Weapon: FAL. A 20 round capacity gas-operated battle rifle from the 1950s. While it is characteristically similar to the German G3A3, aesthetically it is a different beast altogether and it can be found on the Militia Squad Leader, Militia Medic and Insurgent Fighter roles. New Weapon: L22A2. An ultra-short carbine variant of the L85A2 series. It is designed for vehicle crewmen and sports a significantly cut down barrel and integrated foregrip. New Weapon: SKS PU-1 3.5x Scope. A SKS with an old PU-1 optic mounted on the side. This old WW2 era sight can be ranged out to 1000m and almost turns the SKS into a low caliber designated marksman rifle. Available to Insurgent and Militia Scouts and Squad Leaders. New Weapon: RPG7v2 PGO-7 2.8x Scope. The RPG-7V2 package adds the PGO-7 2.8x optic to the launcher, for both Russian LAT and HAT roles. This allows Russian anti-tank gunners to better acquire targets and account for distance with the built-in projectile drop compensator reticle. This reticle accounts for all ammunition types. New Weapon: M4 Classic Handguard M68M. For the Militia Squad Leader, a M68 has been mounted on the classic iron sights carry handle for much better target acquisition in CQB. New Soldier Characters: All Crewman roles have new unique soldier characters with helmets designed for operations in vehicles. Squad Leaders and riflemen can access scoped rifles at 3 players (with another scoped rifle available at 6 players) in the squad. Projectiles now decelerate over distance. As a consequence, optic sight reticles have been tweaked to account for this change. In general, weapons have a slightly flatter trajectory for the first few hundred meters, but dramatically drop off. Tweaked third person weapon locations for almost all weapons. Tweaked gunshot sounds at various ranges for the AK-74, AKM, M4, G3 series, PKM, and M240 GPMG series. Tweaked the look of the M68 Aimpoint, giving it a proper tube-like effect when looking through it. Widened rear sight apertures and brought the sights on the G3, AK74, AKM and RPK series closer to the screen, making it easier to acquire a target when sighting with these weapons. Redid audio on the Field Dressings and added an additional part to the animation when reviving other players vs just stopping the bleeding. Damageable components have been added to all vehicles. All vehicles have now a damageable engine compartment and all applicable vehicles (typically IFVs and Tanks) have a damageable ammunition storage compartment. Damaging the engine will cause the vehicle to lose its max speed and have severely hampered mobility while destroying a vehicle’s ammo storage will deal critical damage to the vehicle and typically would lead to total destruction. Crewman kits now have a Repair Toolbox that can be used to repair Vehicle Hull and Vehicle Components. Left-click and hold on any vehicle that has been severely damaged. The Repair Toolbox will only repair vehicle Hulls back to 25% health and Vehicle engines up to 50% health. Repair Toolbox will not repair beyond that, so you will have to bring the vehicle back to Vehicle Repair Depot to get back to 100% fighting strength. Smoke Generators are available to almost all tracked and heavy wheeled vehicles. These are available to the driver and give the ability to quickly deploy a smoke screen from the exhaust pipe that trails along with the vehicle. This can be used as a means of retreat for the vehicle or as a way to cover infantry in an advance. The engine must be turned on in order to use the smoke generator, which produces 30 seconds of continuous smoke with a full load. Turret Stabilization has been implemented on all vehicle turrets that have them in reality. This means the M1A2 Abrams, T72B3, BTR-82A, MTLB 6MB 30mm, M1126 Stryker CROWS, MATV CROWS and Bradley IFV (with the FV510 and KPVT turreted vehicles being the exception). Players will need to turn on stabilization upon entering the gunner or commander seats of these vehicles (Default: Z). When stabilization is turned on, the gun will attempt to stabilize its orientation independent of what the base vehicle is doing as it is moving, as well as compensate for recoil. Hunter-Killer Feature: For M1A2 Abrams, T72B3 and Bradley IFV Gunners and Commanders in stabilized turret; they have the ability to designate and slew to each others’ views. Pressing “Designate Target for Gunner” (Default: Spacebar) will force the other crew member to turn to what you are looking at and “Set View on Designated Target” (Default: E) will turn your own gun to what the other crew member is viewing. This system is intended to strengthen the bond between gunner and commander and for the commander to properly prioritise targets when in combat. New Vehicle: M1A2 Abrams, a US Army Main Battle Tank. This tank has a 3-man crew (Driver, Gunner, and Vehicle Commander) and comes equipped with a turret-stabilized manually loaded 120mm smoothbore cannon capable of firing armor-piercing sabot and high explosive anti-tank rounds. The Vehicle Commander has an M2A1 Browning .50cal heavy machine gun mounted on a remote weapons system, allowing for full 360-degree traversal and zoom capability. The loader’s seat (while not required to actually load the cannon) is an extra seat on the turret with its own M240 machine gun. New Vehicle: T72-B3, a Russian Main Battle Tank. This tank has a 3-man crew (Driver, Gunner and Vehicle Commander) and features a turret-stabilized 125mm smoothbore cannon fed by an auto-loader. The cannon can fire an array of different ammunition types ranging from armor-piercing sabot rounds to high explosive anti-tank, anti-infantry fragmentation rounds and even the 9M119M Refleks anti-tank laser-guided missile. In addition to this large arsenal to its main gun, the gunner has the usual 7.62mm PKT coaxial machine gun and smoke grenade launchers. In comparison to the Abrams, the T72B3 is a much lower profile tank, almost 2/3rds the height and weight. Its autoloader is slightly slower than a human loader and also presents a vulnerability with the ammunition stored directly below the turret. New Vehicle: FV432, a British Armored Personnel Carrier. The FV432 is a heavily armored APC that can carry up to 10 passengers, as well as the driver. The vehicle has a turret mounted .50cal M2A1 Browning manned by one of the passengers. The Bradley IFV gunner now has a new ballistic reticle to help aim shots over long distances. The M2A1 Browning CROWS gunner also has a new ballistic reticle to help aim shots over long distances. Rocket Artillery Technical has been improved with the spread of the rockets tightened significantly and the velocity increased greatly. 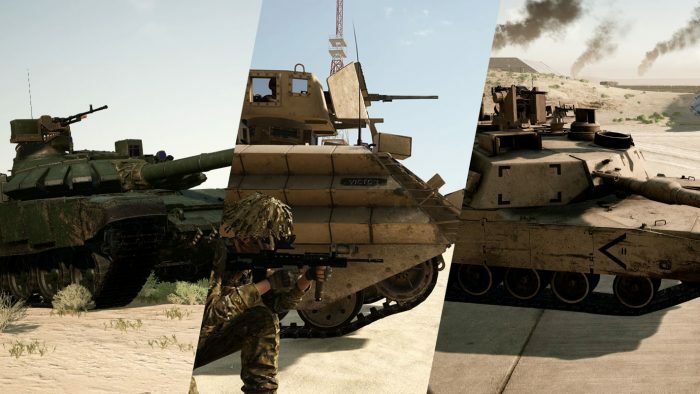 Desert textures have been added to all British vehicles to have them better blend into their combat environments. Additional seats have been added to all Logistics trucks in an effort to combine the properties of the transport trucks and logistics. Their supply capacity has also been increased to 3000. Decoration in the form of ammo boxes, ropes, infantry gear, and camo-netting has been added to almost every vehicle to give their look a bit more life and character. Camera shake and blast damage have been added to large 25mm/30mm autocannons. Don’t stand too close! Recoil is now visual for all autocannons and HMGs. What the player sees as recoil is induced by camera shake from the firing action. Driver can now see how much ammo points in total the vehicle requires to be fully rearmed with ammo point cost is displayed on the speedometer. The Gunner can also see how much ammo points in total the vehicle requires to be fully rearmed, displayed in the inventory sidebar. Vehicle wrecks have been improved visually, allowing for the orientation of the turret and gun to be preserved at moment of death. New Weapon Emplacement: 9M113 Kornet ATGM. A laser-guided anti-tank guided missile for the Russian forces. One advantage this system has over the TOW is the ability for the gunner to be behind cover and still have the ability to fire, making it a little more operator-friendly in battle. Emplacements will start empty and unloaded upon finishing construction. This means the player upon entering will start the reload cycle if there is enough ammunition from the FOB to draw upon. Sandbag and Razor Wire Emplacements are now more resilient to fragmentation projectiles. New Map: Tallil Outskirts: This map is based on Tallil Air Base and its historic role in the South Iraqi region during the 1980s Iran-Iraq war, the 1990s Gulf War, and as a joint Iraq-U.S. airfield today. The most predominant features are its massive aircraft bunkers and defensive positions surrounded by mostly open sandy desert, rocky outcrops, and villages. The map’s focus is on vehicle-based combat, but infantry squads that work in conjunction with armored units will find great success on the battlefields of Tallil. Map Update: Yehorivka: Expanded the playable area to 5×5 km, which opens up a lot of new possibilities for new gameplay layers and completely new flag areas to fight over. The Storage Site area has been replaced with smaller profile villages and hamlets. In addition to accommodating larger vehicles, we’re providing more cover for infantry with new points of interest and better forests and ditches. Map Update: Belaya Pass: Changes include lessening the snow coverage, adding more foliage for concealment when maneuvering between flags, and also roughening the terrain to give more opportunities for cover when crossing open ground. Map Update: Kohat Toi River Valley: The main base in the northeast has been moved back and reconfigured so that vehicles can’t take advantage of the high vantage point and aren’t subject to danger immediately upon leaving main. Also, the original scrubland trees have been replaced with a newer, more collision-friendly variety. Map Update: Jensen’s Range has been overhauled. 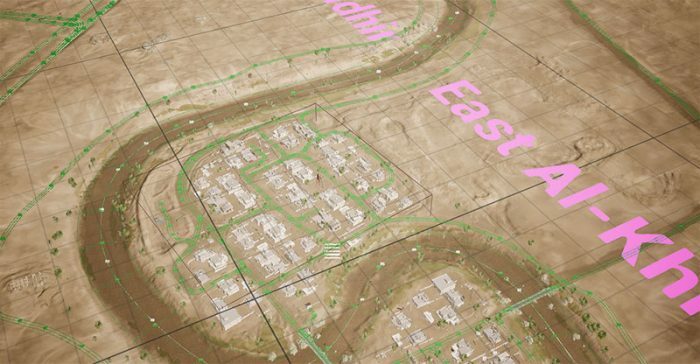 The most notable change is the addition of surrounding terrain as a backdrop, but also we’ve added a number of additional ranges to the map, including a MOUT training field with multi-story buildings, an indoor kill-house with a linear path to work those CQB skills, a new driving track, and a 1.5km open range with elevation for vehicles. 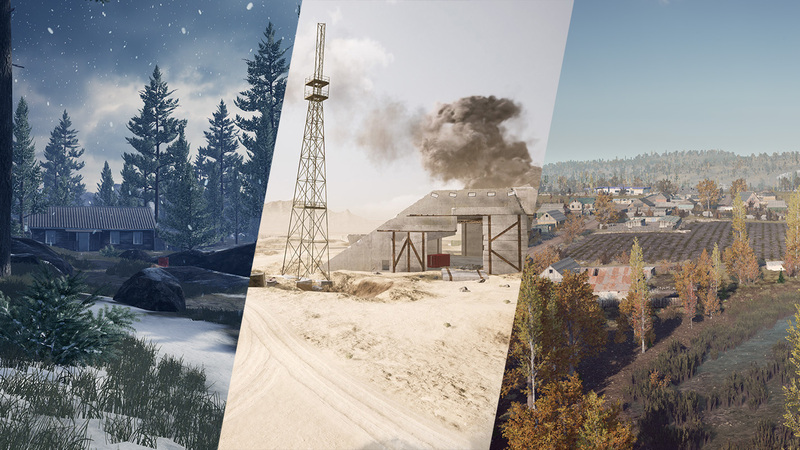 New Skirmish layers have been added to a variety of maps including Tallil, Narva, Kohat and Yehorivka. Perfect for seeding servers or low population gameplay. Operation First Light has been retired from the official map rotation. A new Team Selection Menu has been added upon joining a server. This has information on the map, game mode, as well as the factions from which you can choose. The Deployment Menu has been completely overhauled visually. There is a separate tab called Role Loadouts for players to choose their role, but also to preview the role inventory and character model. Fireteam organisation has been added. 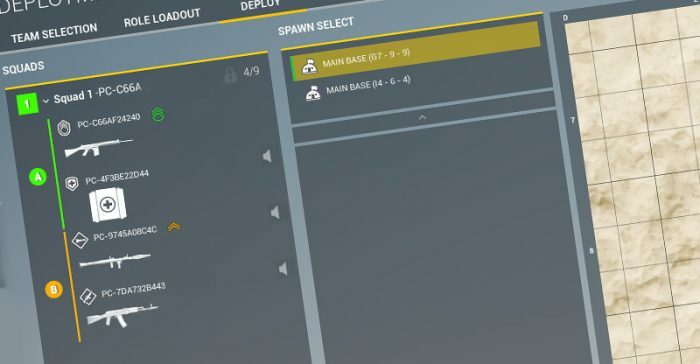 Fireteams can be created dynamically by the Squad leader dragging and dropping players from the Squad list into their desired fireteam, or via right-click menu. Fireteams are hidden by default and are a totally optional feature for those wishing more control over their squad. Fireteam leaders do not have a special kit: they are just a designation that the Squad Leader can give to any member of their squad. Fireteam leaders will be able to place (and delete) their own fireteams Move, Attack, Defend, Observe, Build commands via the Command UI map screen and the 3D HUD T-menu. Squad leader can see and place all Fireteam markers, Fireteams see their own FT marker and the SL marker. Each of the four FTs is color and letter-coded, with the VOIP and nametags reflecting the appropriate FT assignment. The Squad Leader map menu has been updated to a more sensible design with better tooltips and options to put down order markers for your Squad and Fireteams. More types of request markers (I.e., requesting ammunition, or requesting reinforcement, etc.) are also available. Squad Leaders can now put down a team-visible Point-of-Interest marker that designates the squad that put it down, as well as its grid coordinates. A new Command Menu has been added (Default: Capslock). Command Menu has the largest map layout. In the future, this will be used for commander functions. We want to continue building these tools to encourage Squad leaders working together, as well as encourage the use of the Command Menu. FOBs now have the ability to show the amount of construction/ammo points they have, displayed above the FOB icon. FOBs also can now display their buildable radius and the radius at which they exclude each other. In addition, Squad Leaders can now place a “Request FOB” marker which will display via 2 yellow dotted circles, the build diameter and exclusion zone diameter of that potential FOB location. “Map Filter” buttons above the map that can be turned on and off to best suit the current needs. 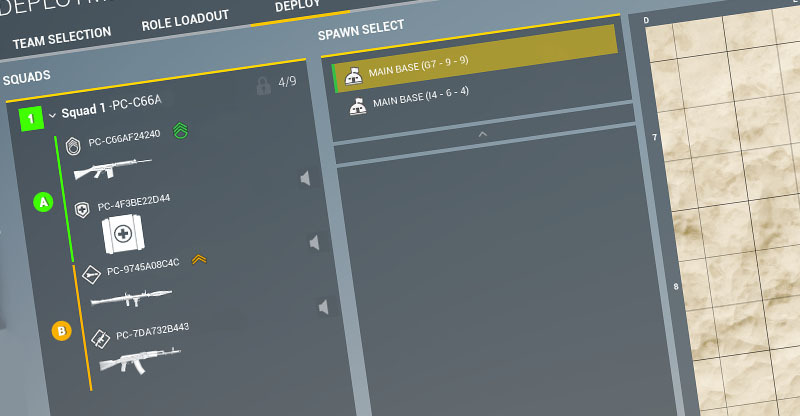 Players will have the option to view all player markers on the map as their appropriate role’s icons. Players who are not in command positions (I.e., not Squad Leaders or Fireteam Leaders) have the ability to ping the map by right-clicking. This ping has a cooldown of about 6 seconds and can be used to communicate map positions to anyone in the squad. Moved the grid display of mouse position next to the actual mouse cursor on maps that allow for mouse usage. All minimaps have been updated for better definition of roads and structures. Roaming Map (“M” Map) now has mouse-wheel zoom functionality. FOBs and HABs that have their spawns blocked now show that state on the map. Added a timer countdown to next map load at the bottom of the scoreboard at the end of the round. Fixed healing and bandaging animations not playing in third-person for other players. Fixed no Crewman kit warnings not showing sometimes. Various fixes for Steam Inventory items. Fixed some animation popping on the AK-74 series and the M4 series. Fixed hand going through the scope during the PKP reload animation. Localisation (Partial) for the following languages has been updated and added: Arabic, Brazilian Portuguese, Bulgarian, Czech, Danish, Dutch, Finnish, French, German, Greek, Hungarian, Italian, Japanese, Korean, Norwegian, Polish, Portuguese, Romanian, Russian, Simplified & Traditional Chinese, Spanish, Swedish, Thai, Turkish and Ukrainian. Different versions of Jensen’s Range are selectable via the menu, depending on which faction you want to try out. Added Message Of The Day (MOTD) for servers. Configurable by MOTD.cfg in ServerConfig of server installation. Wow, that’s a lot of changes! We’d like to offer a quick reminder that some of the above values may change during testing, so be sure to give us your feedback. As some of you know, testing is on-going with the intent to expand as soon as we can. If you’ve made it all the way to the end, go get yourself some R&R! You’ve earned it!